If a tie occurs in the Electoral College, how many electoral votes would both major party candidates have? What U.S. president said: "A wise and frugal government...shall not take from the mouth of labor the bread it has earned"? 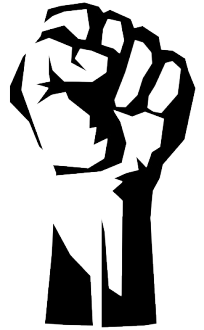 What notorious Stalinist regime ruled Cambodia from 1975 to 1979? Who was the first African-American Supreme Court justice? What U.S. president went on national television dressed in a cardigan sweater to urge people to lower their thermostats? What state is home to Abraham Lincoln's birthplace? 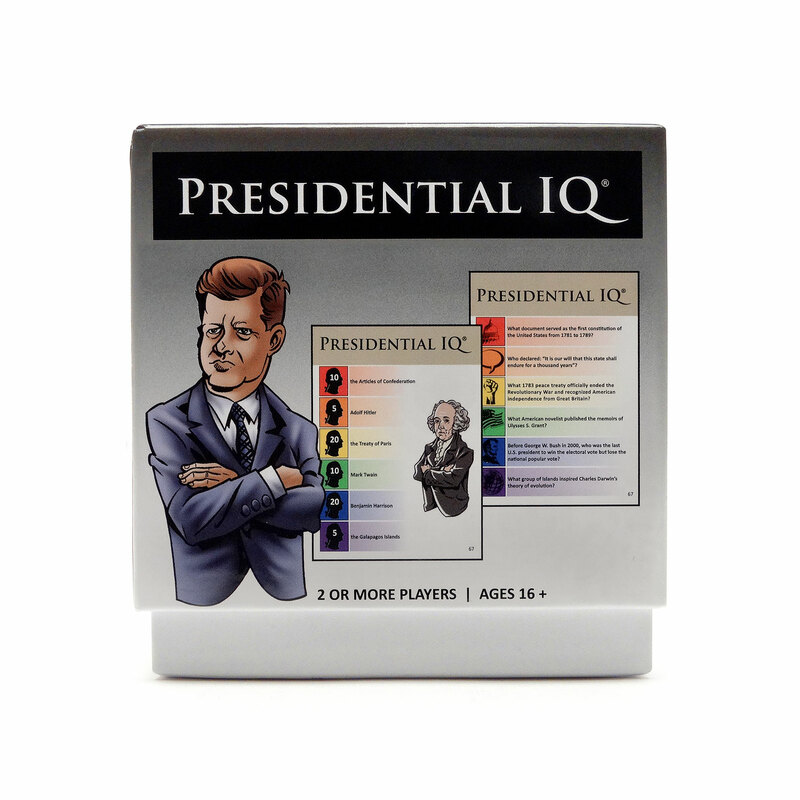 Presidential IQ is a unique trivia game covering a wide variety of facts and tidbits that U.S. presidents have encountered throughout American history. 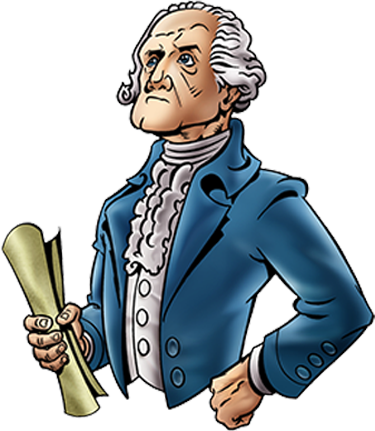 The game’s mission is to spread knowledge and appreciation of civics and history in a fun way in any setting. Perfect for educators, people who already love history and politics, and for those who should really know more! To win the game, be the first player or team to earn 200 IQ points by answering questions correctly from six different categories across three levels of difficulty. Ever since 1789, U.S. presidents have encountered a wide array of facts and interesting tidbits while carrying out the duties of the presidency. Indeed, presidents must sift through tons of information from daily briefings, meetings, analysis, and news reporting to make important decisions. 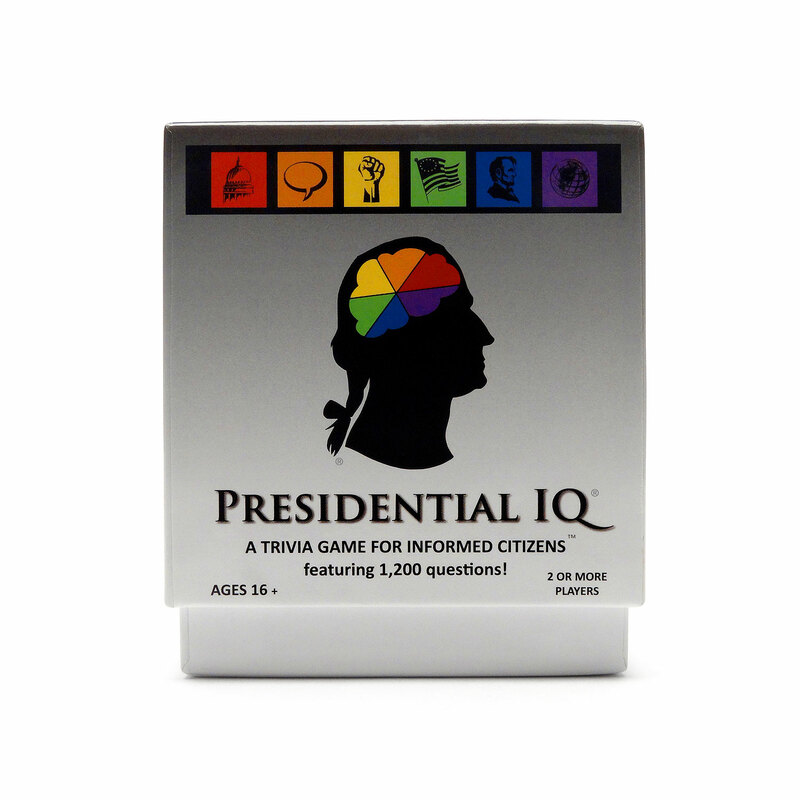 Presidential IQ has compiled a large assortment of these facts and tidbits, from Washington to Trump, covering six categories of presidential knowledge including Government, Famous Quotes, Foreign Affairs, American History, Presidential Trivia, and Geography. With 1,200 questions spanning three levels of difficulty, there’s enough content here to challenge even the smartest know-it-alls. Each category consists of 200 questions and answers. Rolling the custom die determines which category is selected. Click left or right below to browse the categories. Put your social science brain cells to the test. This Website is offered and available to users who are 13 years of age or older. By using this Website, you represent and warrant that you are of legal age to form a binding contract with Presidential IQ and meet all of the foregoing eligibility requirements. If you do not meet all of these requirements, you must not access or use the Website. 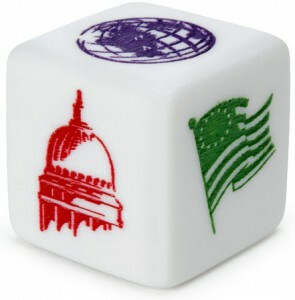 The Website and its entire contents, features and functionality (including but not limited to all information, software, text, displays, images, video and audio, and the design, selection and arrangement thereof), are owned by Presidential IQ, its licensors, or other providers of such material, and are protected by United States and international copyright, trademark, patent, trade secret and other intellectual property or proprietary rights laws. 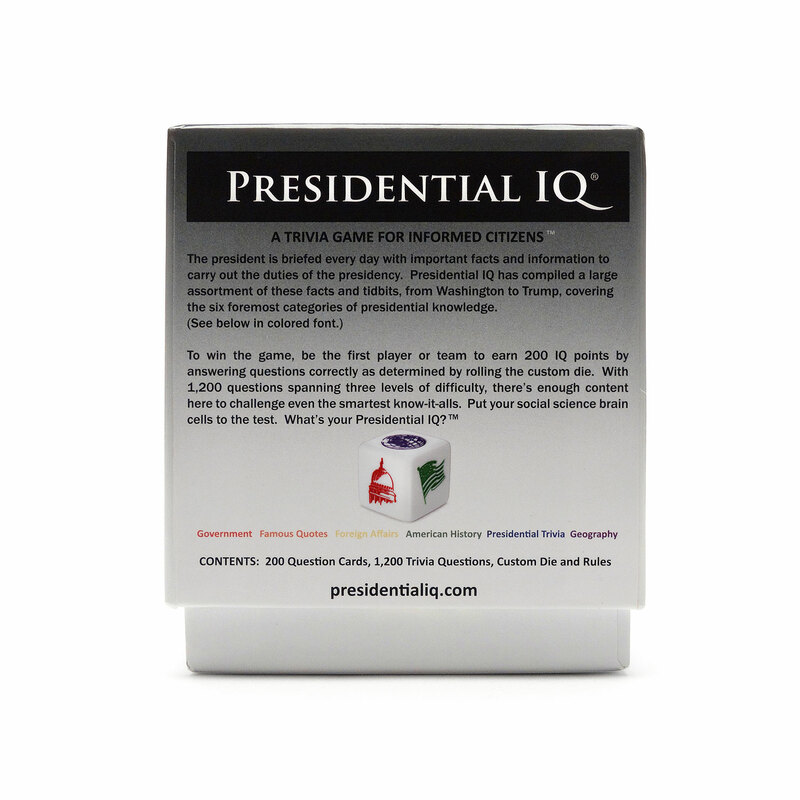 The Presidential IQ name and trademark, related trademarks (such as the Presidential IQ logo, “PRESIDENTIAL IQ” and related taglines), and all related names, logos, product and service names, designs and slogans are trademarks of Presidential IQ or its affiliates. You must not use such marks without the prior written permission of Presidential IQ. 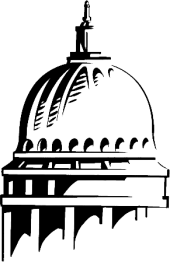 You may link to our homepage, provided you do so in a way that is fair and legal and does not damage our reputation or take advantage of it, but you must not establish a link in such a way as to suggest any form of association, approval or endorsement on our part without our express, written consent. We make no claims that the Website or any of its content is accessible or appropriate outside of the United States. Access to the Website may not be legal by certain persons or in certain countries. 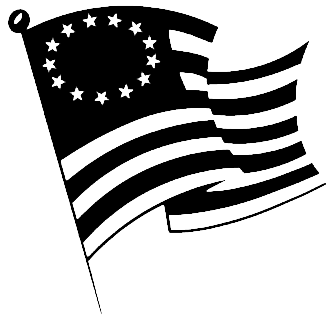 If you access the Website from outside the United States, you are responsible for compliance with local laws. YOUR USE OF THE WEBSITE, ITS CONTENT, AND ANY SERVICES OR ITEMS OBTAINED THROUGH THE WEBSITE IS AT YOUR OWN RISK. THE WEBSITE, ITS CONTENT AND ANY SERVICES OR ITEMS OBTAINED THROUGH THE WEBSITE ARE PROVIDED ON AN “AS IS” AND “AS AVAILABLE” BASIS, WITHOUT ANY WARRANTIES OF ANY KIND, EITHER EXPRESS OR IMPLIED. NEITHER PRESIDENTIAL IQ NOR ANY PERSON ASSOCIATED WITH PRESIDENTIAL IQ MAKES ANY WARRANTY OR REPRESENTATION WITH RESPECT TO THE COMPLETENESS, SECURITY, RELIABILITY, QUALITY, ACCURACY OR AVAILABILITY OF THE WEBSITE OR THE CONTENT THEREIN. WITHOUT LIMITING THE FOREGOING, NEITHER PRESIDENTIAL IQ NOR ANYONE ASSOCIATED WITH PRESIDENTIAL IQ REPRESENTS OR WARRANTS THAT THE WEBSITE, ITS CONTENT OR ANY SERVICES OR ITEMS OBTAINED THROUGH THE WEBSITE WILL BE ACCURATE, RELIABLE, ERROR-FREE OR UNINTERRUPTED, THAT DEFECTS WILL BE CORRECTED, THAT THE SITE OR THE SERVER THAT MAKES IT AVAILABLE ARE FREE OF VIRUSES OR OTHER HARMFUL COMPONENTS OR THAT THE WEBSITE OR ANY SERVICES OR ITEMS OBTAINED THROUGH THE WEBSITE WILL OTHERWISE MEET YOUR NEEDS OR EXPECTATIONS. 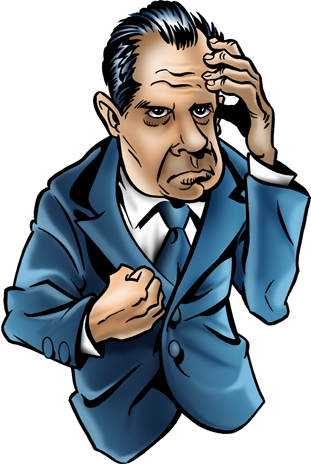 PRESIDENTIAL IQ HEREBY DISCLAIMS ALL WARRANTIES OF ANY KIND, WHETHER EXPRESS OR IMPLIED, STATUTORY OR OTHERWISE, INCLUDING BUT NOT LIMITED TO ANY WARRANTIES OF MERCHANTABILITY, NON-INFRINGEMENT AND FITNESS FOR PARTICULAR PURPOSE. THE FOREGOING DOES NOT AFFECT ANY WARRANTIES WHICH CANNOT BE EXCLUDED OR LIMITED UNDER APPLICABLE LAW. 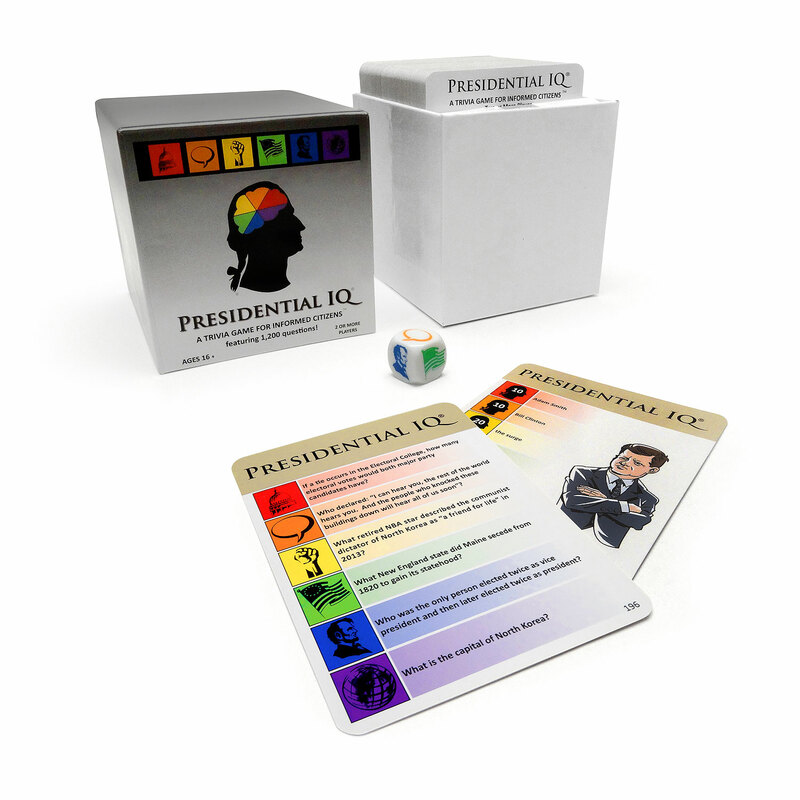 IN NO EVENT WILL PRESIDENTIAL IQ, ITS AFFILIATES OR THEIR LICENSORS, SERVICE PROVIDERS, EMPLOYEES, AGENTS, OFFICERS OR DIRECTORS BE LIABLE FOR DAMAGES OF ANY KIND, UNDER ANY LEGAL THEORY, ARISING OUT OF OR IN CONNECTION WITH YOUR USE, OR INABILITY TO USE, THE WEBSITE, ANY WEBSITES LINKED TO IT, ANY CONTENT ON THE WEBSITE OR SUCH OTHER WEBSITES OR ANY SERVICES OR ITEMS OBTAINED THROUGH THE WEBSITE OR SUCH OTHER WEBSITES, INCLUDING ANY DIRECT, INDIRECT, SPECIAL, INCIDENTAL, CONSEQUENTIAL OR PUNITIVE DAMAGES, INCLUDING BUT NOT LIMITED TO, PERSONAL INJURY, PAIN AND SUFFERING, EMOTIONAL DISTRESS, LOSS OF REVENUE, LOSS OF PROFITS, LOSS OF BUSINESS OR ANTICIPATED SAVINGS, LOSS OF USE, LOSS OF GOODWILL, LOSS OF DATA, AND WHETHER CAUSED BY TORT (INCLUDING NEGLIGENCE), BREACH OF CONTRACT OR OTHERWISE, EVEN IF FORESEEABLE. THE FOREGOING DOES NOT AFFECT ANY LIABILITY WHICH CANNOT BE EXCLUDED OR LIMITED UNDER APPLICABLE LAW. 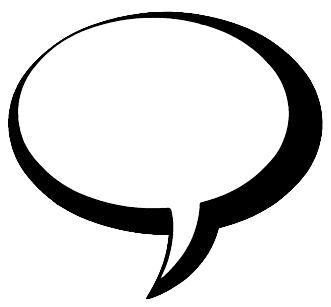 All other feedback, comments, requests for technical support and other communications relating to the Website should be directed to: information@presidentialiq.com. This Policy applies to and describes the information we may collect from you or that you may provide when you visit the website at PresidentialIQ.com (our “Website”) and our practices for collecting, using, protecting, and disclosing that information. This Policy does not apply to information collected by Presidential IQ offline, through social media channels, or through other means, including on other websites operated by Presidential IQ or a third party. Please read this Policy carefully to understand our policies and practices regarding your information. This Policy may change from time to time. Your continued use of this Website after we make changes is deemed to be acceptance of those changes, so please check the Policy periodically for updates. Our Website is not intended for persons under 13 years of age. No one under age 13 may provide any information on the Website. We do not knowingly collect personal information from children under 13. If you are under 13, do not use this Website. If we learn we have collected or received personal information from a child under 13 without verification of parental consent, we will delete the information. We collect a limited amount of personally-identifiable information from and about certain users of our Website, and only if they choose to submit such information to us through the “Contact Us” page of the Website or, with respect to email addresses, when a user chooses to “Subscribe for Updates” by submitting an email address. Information we may collect through the “Contact Us” function of the Website potentially includes a user’s first name, last name, phone number, email address, company information, and anything else the user chooses to include in contacting us. 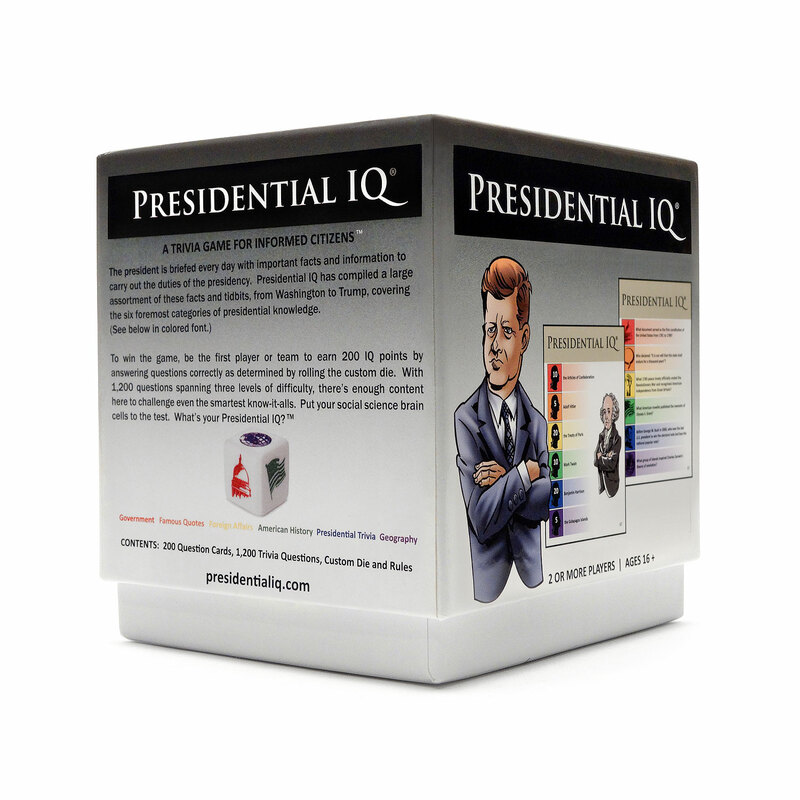 Presidential IQ uses the information collected through the Contact Us page only for the purpose of improving our products, our Website, or contacting the person whose information has been provided. in other cases with your prior consent. if we believe disclosure is necessary or appropriate to protect the rights, property, or safety of Presidential IQ, our customers or others. We have implemented measures designed to secure your personal information from accidental loss and from unauthorized access, use, alteration and disclosure. Unfortunately, the transmission of information via the Internet is not completely secure. Although we do our best to protect your personal information, we cannot guarantee the security of your personal information transmitted to our Website. Any transmission of personal information is at your own risk. 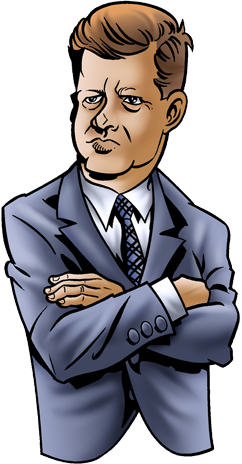 We are not responsible for circumvention of any privacy settings or security measures. 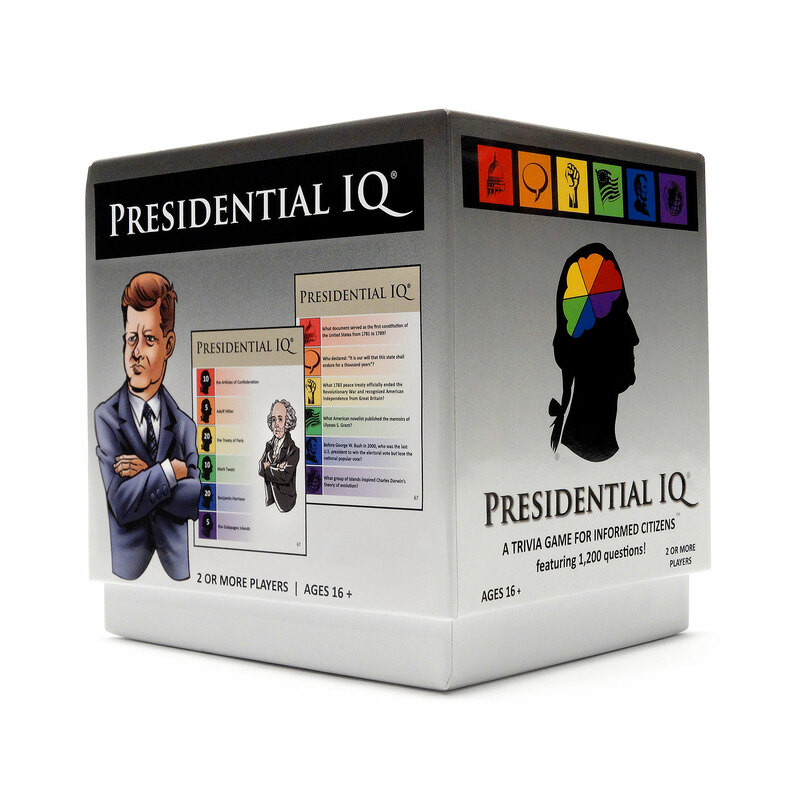 Stay informed about news and future product offerings from Presidential IQ. 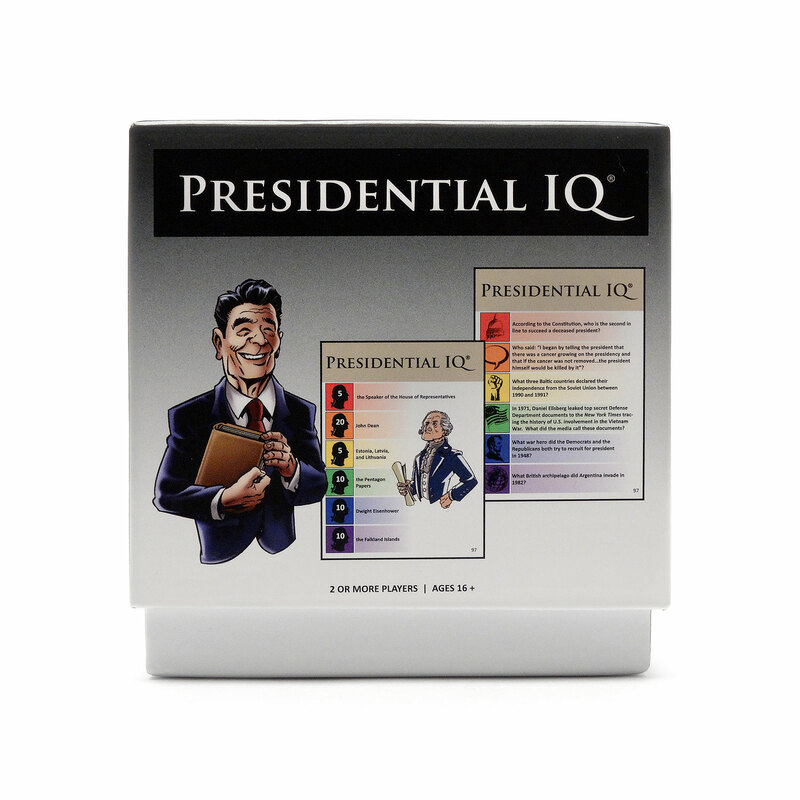 PRESIDENTIAL IQ and the associated logo are registered trademarks of the PRESIDENTIAL IQ GAME COMPANY LLC. 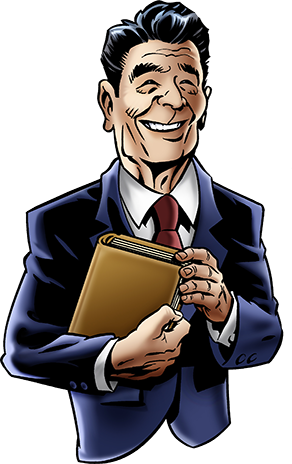 The tagline “A Trivia Game For Informed Citizens” is a trademark of the same company © 2019, All rights reserved.